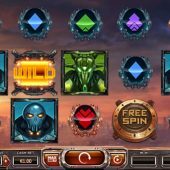 The Swedish developer Yggdrasil produce slots quite infrequently but they tend to be very popular, with smooth and exciting graphics, and Super Heroes slot is no different. The super heroes are fictional characters and not the licensed types from the likes of Marvel or DC Comics. So what are your chances of being a victim or beneficiary of their powers? 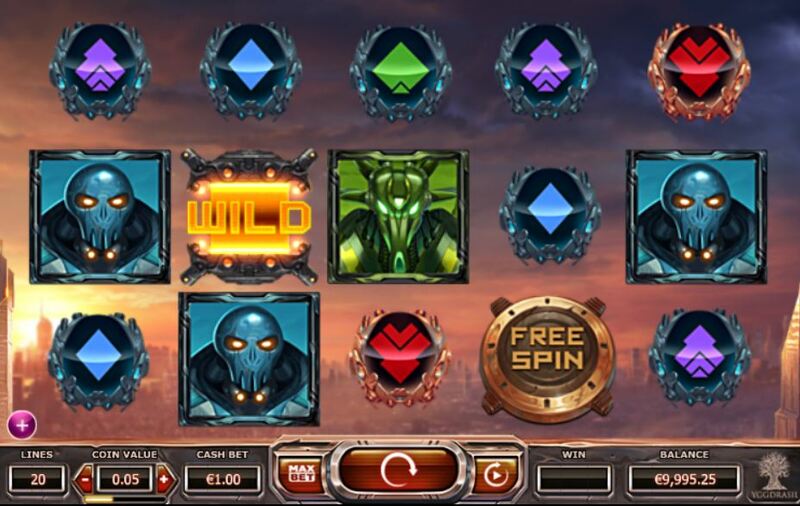 The Super Heroes slot has 20 paylines and single characters, including non-multiplying Wilds and scatters on all reels. The RTP is a very respectable 96.10% and we have 5 reels and 3 rows, so a typical video slot configuration. The Wild is highest-paying at 10x stake for 5-of-a-kind (5OAK) and the lowest card pays 3.20 x stake for 5OAK. Now you may think these are low for a 20-line slot, more typical of values on a multiway game, but there is a good reason for this which I will explain next. There are a whopping 5 types of in-play random features, which occur quite frequently. A superhero may appear at either end of the game, and if one doesn't provide a win, the other will. They all have a power meter which in the free games is increasing, but a random amount of 1-4 is applied during the base game - usually 1! MIRAGE the green lady may appear and turn the high-value symbols into dice which award coins for the numbers displayed on their faces. 0.25x - 50x stake is possible. RAVEN the red lady may throw her blade to turn 1-4 reels Wild. HOPPER the yellow man will shower the reels with meteors which turn random symbols Wild. TESLA the grey man will smash the reels and some symbols will will break and all transform to the same random symbol. KNOX the orange man will fire a beam into the reels and award 2, 3, 4, or 5x to the win which occurs, depending on his power level of 1-4. TRANCE the blue lady only appears during free games and will add 1, 2, 3 or 4 extra spins depending on her power level. 3, 4, or 5 scatters will trigger 4, 5, or 7 free spins. Now as you may have guessed, the Super Heroes are primed for this action and each spin you are guaranteed that one will appear at each end. This is where TRANCE the blue lady is important, as you start with a low amount of games, she adds extra spins. In the free spins the powers are cumulative, so to get the full benefits you need to see them all 3 or 4 times, which won't happen unless TRANCE adds extra spins. The appearance of RAVEN is important here too, as when on full power she will add 4 Wild reels when appearing. If KNOX is also on full power, then the biggest win occurs if they both appear - 4 Wild reels with a 5x multiplier. This could pay near 1000x stake! This Super Heroes slot is an excellent concept and the graphics are superb. The variance is low-medium I would say and decent smaller wins are frequent. The free spins aren't too hard to hit although you do feel some disappointment if TRANCE doesn't appear to extend them which is vital if you are to achieve a big return via the cumulative Super Hero powers. I will definitely be taking on these Super Heroes again and rate this game highly among other Super Hero-themed slots such as NextGen's Justice League or Playtech's Batman and Catwoman Cash.